Newater Technology, Inc. Announces it will Acquire Israeli AMS Technologies Int. (2012) Ltd to Expand into the Global Market - News - Newater Technology, Inc.
YANTAI, CHINA / ACCESSWIRE / December 1, 2018 / Newater Technology, Inc. (NEWA) ("NEWA", "we," "our" or the "Company"), a service provider and manufacturer of membrane filtration equipment and related hardware and engineered systems that are used in the treatment, recycling and discharge of wastewater, today announced it will acquire 100% of the equity of Israeli AMS Technologies Int. 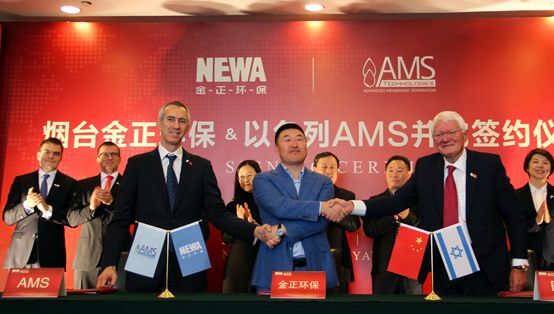 (2012) Ltd ("AMS"), and the signing ceremony for the acquisition was held in Yantai on November 28, 2018. The Company was listed on the Nasdaq Capital Market in 2017 and believes this is a significant step to expand into the global market. NEWA will acquire 100% equity of AMS, a company that develops and markets chemically and thermally stable and resistant ultrafiltration and nanofiltration special membrane materials used in wastewater treatment. The total contract amount for this acquisition is approximately $13.5 million. The Company will acquire AMS with its working capital. The acquisition agreement was signed on November 28, 2018. All the due diligence has been completed and closing of the transaction is expected to occur in March 2019. Through this strategic acquisition and additional partnerships, NEWA believes it will realize vertical supply chain integration from the preparation of special membrane materials, to the production of membrane elements, to the manufacturing and assembling of the membrane equipment and projects. The Company's Chairman and CEO, Mr. Yuebiao Li commented: "NEWA is a high-tech environmental protection enterprise engaged in the recycling of wastewater into high-quality reclaimed water. Since its establishment, it has adhered to the development strategy of "based in Yantai with a global impact" and is committed to becoming the leader in wastewater treatment in China and globally. The Company believes it has built a state of the art fully automated membrane element production line, enabling it to achieve large-scale production of membrane elements. Our technology has met the zero-emission and resource-recycling requirements for the treatment of high-difficulty wastewater in various industries such as high salinity industrial and landfill leachate wastewater." "By acquiring a company with a leading international membrane materials manufacturing and development technology, Chinese companies have the opportunity to catch up with globally leading companies in membrane materials technology. We believe AMS is one of the few companies in the world that can offer innovative acid-stable, alkaline-stable and solvent stable nanofiltration and ultrafiltration membranes that can be applied in different industries. Its innovative technology can help fill the gap in current Chinese domestic technology. After the merger, NEWA plans to promote the special membrane separation technology by establishing demonstration projects in different fields, and accelerating the preparation and application of the special membrane-based separation solution technology in wastewater treatment in China." At the contract signing ceremony, officials from the Yantai Municipal Government and Yantai Environmental Protection Bureau, and representatives from the financial community who have long supported NEWA were in attendance for the signing ceremony between Mr. Yuebiao Li, the Chairman and CEO of the Company, and Dr. Johannes Sittard, the original shareholder of AMS, and Mr. Gil Meron, the CEO of AMS. About AMS Technologies Int. (2012) LTD.
AMS develops and markets chemically and thermally stable ultrafiltration (UF) and nanofiltration (NF) membranes. These membranes represent a technological breakthrough through significant improvement in the economics of inorganic compounds recovery. AMS offers a complete product line of extreme acid, alkaline, solvent, thermal and pressure stable membranes. Its core technology adds significant value in various applications and industries through cost savings, improved recovery rates, greater acid/alkali/solvent supply reliability and clear environmental benefits. Its primary focus is on the mineral extraction sector (Mining) and industries with harsh operating environments such as pharmaceutical, pulp, rayon, dairy, and chemicals. Its technology enables state-of-the-art UF and NF membrane integrated parameters (acid, solvent, temperature and pressure stability) that are superior to competing polymeric membranes on the market, while still maintaining high performance of flux and rejection. AMS acquired all assets of Bio Pure Technology Ltd. (BPT) in 2012. BPT was a leading developer of advanced membrane-based separation solutions for water, wastewater treatment, and chemical process industries with a focus on the delivery of superior products to the market. It attributes its great success to its expertise in membrane development and manufacturing, process design and system engineering. This press release contains forward-looking statements as defined by the Private Securities Litigation Reform Act of 1995. Forward-looking statements include statements concerning plans, objectives, goals, strategies, future events or performance, and underlying assumptions and other statements that are other than statements of historical facts. When the Company uses words such as "may", "will", "intend", "should", "believe", "expect", "anticipate", "project", "estimate" or similar expressions that do not relate solely to historical matters, it is making forward-looking statements. Specifically, the Company's statements regarding 1) its ability to complete the acquisition of AMS; 2) its ability to expand into the global market; 3) its ability to realize vertical supply chain integration; 4) its ability to become a leader in wastewater treatment in China and globally; 5) its ability to achieve large-scale production of membrane components; 6) its ability to successfully promote and utilize the technology it will acquire from AMS; 7) the ability of AMS's technologies to be applied in different industries are forward-looking statements. Forward-looking statements are not guarantees of future performance and involve risks and uncertainties that may cause the actual results to differ materially from the Company's expectations discussed in the forward-looking statements. These statements are subject to uncertainties and risks including, but not limited to, the following: the Company's goals and strategies; the Company's future business development; product and service demand and acceptance; changes in technology; economic conditions; the growth of the water filtration industry in China; reputation and brand; the impact of competition and pricing; government regulations; fluctuations in general economic and business conditions in China and assumptions underlying or related to any of the foregoing and other risks contained in reports filed by the Company with the Securities and Exchange Commission. For these reasons, among others, investors are cautioned not to place undue reliance upon any forward-looking statements in this press release. Additional factors are discussed in the Company's filings with the U.S. Securities and Exchange Commission, which are available for review at www.sec.gov. The Company undertakes no obligation to publicly revise these forward-looking statements to reflect events or circumstances that arise after the date hereof.